In early November, 43 Class 40’s are headed out into the Western Approaches on the single-handed classic, the Route du Rhum. While single-handed racing is still a strong design driver for Class 40, the majority of races recognised by the Class 40 Association in Europe, North America and recently the Caribbean are double-handed or ‘fully crewed’. The class is now a truly international affair with yachts flagged as far away as Australia, South Africa and nearer to home in Europe, from Norway in the north, down to Italy in the Mediterranean. Indeed, in 2012 the number of owners/boats based outside of the class’s birthplace, France, exceeded 50% for the first time. Eight years after the class had its first entrants in ‘the Rhum’ and ten years since coming into being there are now more than 140 yachts registered, of these more than twenty are based in North American waters. It’s from a new owner in the United States that Owen Clarke Design’s (OCD) latest commission has originated, a fully custom (although built in female production tooling) Class 40, now under construction at Carbon Ocean Yachts (COY) in Bristol, Rhode Island. Design development began in the Spring of 2014 which has given all of us a good deal of time as well as resource to apply to a design that is significantly different in a number of areas to what has been seen before. It’s worth affirming early on in this article that although often described as Open 40s, the class is definitely NOT open in the sense that most of us would understand the word. 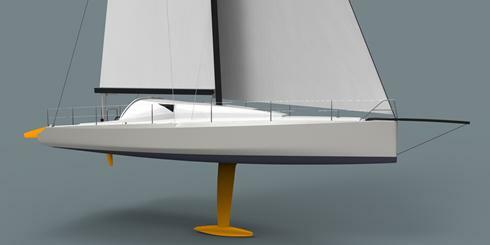 Class 40 is, like any number of successful yacht racing rules such as TP-52, a box rule, which allows designers a degree of freedom to innovate within set parameters. In the case of Class 40 the main drivers in the rule being stability (and so righting moment), length, beam, draft, sail area, displacement and a limitation on construction materials, which is aimed at limiting cost. Changes in the race courses/finishes for the class’s primary target events and the demise of the ‘Transat Anglais’, along with a class rule that has morphed to allow Code 0’s, rotating bowsprits and ever lighter rigs have resulted in more powerful, faster designs in recent years. Changes have also been driven to a certain extent by competitors accepting a higher entry level cost for the construction of their boat. Although this hasn’t resulted in a full on ‘arms race’ as such (production boats still represent by far the greatest % of the fleet), there’s no doubt that the nature of the class has changed from the racer-cruisers that we were designing in 2005/2006 to the very much full on inshore/offshore racing yachts of today. In Europe, for the production Class 40 builders and those designers like us who develop custom and semi-custom boats almost all our focus has been on the big Trans-Atlantic events: Transat Jacques Vabres, Route du Rhum, Route du Chocolat and offshore races such as the Les Sables/Horta/Les Sables. However, not every owner aspires to or has the time to double-hand (never mind race in ‘the Rhum) across the Atlantic and for many Class 40 owners, particularly amateurs or amateurs sailing with pro/semi pro co-skippers, the longest races they’ll take part in are the Fastnet, Normandy Channel , Round Britain, or ‘fully crewed’ RORC type events. In North America the longest courses are in the range of six hundred miles, often less and the weather matrices are very different from the Trans-Atlantic classics. Significantly however, all the 40s in the region with possibly one exception were originally conceived for crossing oceans. A good example of this is that all five of our designs on that side of the Atlantic are classed for Category 0 ocean races. Recognising this, when OCD were contacted by our latest client it was clear from his brief that we should be looking elsewhere ‘within the box’ to produce a design somewhat different from the very high righting moment, high wetted surface, reaching designs that have been developed in the last four years in Europe. Nevertheless, as part of the design process we developed candidate designs of that type, running computer simulations against a series of ever narrower waterline, lower wetted surface alternatives. It’s important to understand that all Class 40s are limited to the same minimum displacement, sail area, maximum stability (measured at 90 degrees), maximum beam and draft. Thus, all the main performance driving numbers are a given. Significantly in terms of performance what remains for the designer to exploit is hull form, appendages and sail plan. Everyone knows that once you change the target events/races and the resulting weather environment, the ‘optimal’ boat changes. To take this onboard and thus extract the advantage required some lateral thinking by ourselves, backed by a forward looking owner and project manager, who both have an open minded logical approach to decision making, and are not afraid to stand out from the crowd. At the very first design kick off meeting the client also made it clear that he was looking to innovate, but add reliability, using where possible US contractors/materials and support/promote Class 40 in North America. This emphasis on innovation while maintaining reliability put some pressure on yard and designers to come up with ways to manage some of our choices since these two requirements obviously don’t always go hand in hand. After three weeks in the United States in May, working on the design with the owner, project manager and visiting various yards, finally, Carbon Ocean Yachts were selected as the builders. Clearly most every owner’s aim when starting such a project is to launch the most competitive Class 40 possible within any limitations set by time and/or budget. Very quickly all parties arrived at the inevitable conclusion that we’d be building in a female tool, not only to save weight in the hull shell but in the hope that it would encourage others to build in the US. Since that initial choice, the decision has been taken to go one step further and a female carbon tool has been produced, carbon being a more stable material than glass. 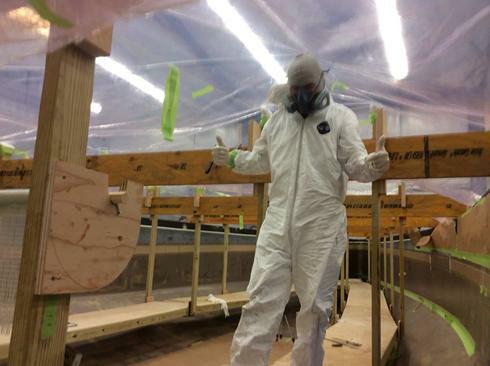 This gave ourselves and the builder the confidence to lower the height of the deck to hull joint down into the vertical panels of the hull topsides and also to aim for a clear coat topside finish, without paint, that judging by the test panels is going to be absolutely stunning. At the time of writing the 3D deck files for the deck cockpit and coachroof had just been released to MouldCam in Bristol RI who are responsible for the 5 axis machining of the female deck tool. Prior to this the hull plug had been scanned by laser to confirm its compliance with design tolerances. The manufacture of the hull mould in carbon and the CNC machining of the deck tool provided the builders with the tolerances required to undertake the hull to deck joint in the yacht’s topsides while maintaining that clear finish all over. Last month’s article in Seahorse, ‘Fashionable Logic’ touched on the details of the yacht’s hull design program along with the weather studies undertaken to target the performance of the hull for the prevailing conditions inshore and offshore in the north-east US. We also covered it in our initial news release: www.owenclarkedesign.com/custom-class-40-open-2014-born-in-the-usa I won’t dwell further on this part of the design process but draw the reader’s attention to the 3D graphic of the design which shows some of the results of the latest hull development program undertaken by OCD in co-operation once again with Annapolis based designer Clay Oliver. While our previous generation of 40s and the majority of later designs carry a hard chine all the way to the bow we have been careful to reduce upright and heeled wetted surface towards the stern by rounding off the aft sections so that they are more in common with our early first generation and less powerful designs such as Bolands Mill (2006). This rounded topside to bottom shell section quickly develops in a way that creates a hard chine aft of the yacht’s center of buoyancy and this carries on past the max waterline beam of the yacht until forward of mid-ships, where the hull form is such that the chine gradually disappears. In the last four years, the European ‘Transat optimised’ 40s have featured a range of bow volumes that by enlarge have been very much greater than 2008/2009 generation boats. These shapes make for a faster reaching boat in medium airs. The resulting hull form produces a chine that (as seen on our earlier design 40 Degrees) extends to the bow. With our new boat, although the bow volume is very much greater than 40 Degrees, we have been careful not to induce excessive upright or heeled wetted surface area in the forward 25% of the yacht. 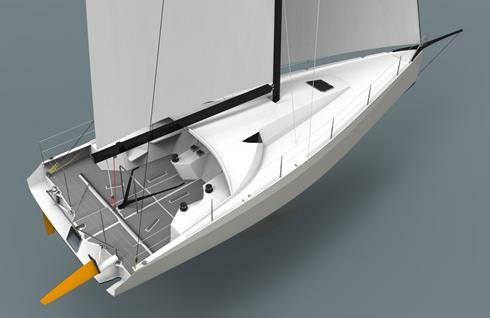 The result is that this new design has for approximately the same waterline beam, two square metres less upright and heeled wetted surface area than an Atlantic optimised boat, for very little reduction in righting moment. In effect the hull form in the middle of the boat continues to develop the form stability for good upwind and reaching performance while we shed wetted surface area towards the bow and stern to improve performance at both lower speeds and angles of heel. Not surprisingly the time spent during the Bermuda races east of the Gulf Stream pushes the average wind speed for this area up, but, given that water ballast goes in upwind at: @ 14 kts and reaching at: @ 16 kts, by far the greatest time is spent on these races not fully powered up and certainly not with water ballast. Hence the new design is targeting optimal upwind/downwind performance in a range of wind speeds from 8 to 12 kts, with a requirement for little or no loss in performance against her more powerful cousins until TWS 15 kts upwind and TWS 17 kts reaching. While it would appear that the distribution of ballast is less important for our Class 40 sailing off the east coast of the USA, or in the English Channel for that matter (in the spring and summer months) when compared to Transat optimised 40s, this isn’t the case. With only 750 litres of ballast available within the rule for a boat that ideally would have 1200 litres or more (were it allowed) to satisfy a complete range of upwind/downwind conditions, the positioning of water ballast tanks on a Class 40 has a very great effect on the relative performance of the boats upwind and downwind. This is often forgotten by all but a few when reviewing the merits of different boats. The performance of what appear from the outside to be identical Akilaria RC2s is quite different depending on their ballast tank distribution, which does vary from boat to boat. With Kingfisher, OCD were the first to introduce the central ballast tank to the Open 60 class as a means of increasing without penalty the righting moment of lighter, narrower designs. This has long since become standard in all Open 60s. One innovation in this 40 is that in order to maximise the range and use of water ballast we have opted for three tanks per side. This approach will help best mitigate any losses against the more powerful Transat boats in the higher wind speeds at a wider range of wind angles. It is a more flexible solution providing essentially an extra gear which the standard two tank layout doesn’t have. Hall Spars have been chosen as the mast supplier for the project, working closely with OCD, who have also contracted independent spar designer Chris Mitchell to provide overview, reporting to the client. This approach of independent checks and balances has also been extended to the design of the keel and lift up rudder systems, all three being deemed as areas requiring additional resources in line with the project’s requirement for both innovation and reliability. The preliminary P1 rig file was supplied by OCD to Hall this month and those who are interested in the class can expect at least two significant differences in the rig on this boat compared to anything before seen in the class. In line with the most recent class 40’s, the keel fin is a fabricated box section with glass/foam fairings fore and aft. The lower half of the keel fairings are hollow allowing for the easy addition and subtraction of lead counterweights to trim the boat within the max righting moment, minimum displacement band of the rule. CNC machining of the fin is not allowed by the class rules, so while the middle of the fin is faired to templates, the forward and aft fairings will be built in glass from moulds, ensuring complete adherence to the foil design and reducing the cost of subsequent units. The keel fin and bulb are to be built in New Zealand and finished at COY, with Steve Koopman of US based DK Structures checking and providing oversight. The frequency and retention of weed on the rudders is more of problem in this area of the world than in Europe and because the races are predominantly of shorter duration time spent dealing with this problem is more critical. Because of the higher percentage of light airs and downwind sailing conditions Class 40’s in the US spend more time than their Transat counterparts at low angles of heel and speeds below ‘hull speed’ where wetted surface area and viscous drag are a more significant factor. As any experienced sailor may know, making these systems 100% reliable has been an issue for many well financed, experienced projects and has been an area which has been problematic in both Open 60 and Class 40s. Not wanting or needing to reinvent the wheel we’ve opted for a system which has ultimately been seen to be successful in Open 60 world and in order to further leave no stone unturned Steve Koopman is also providing support to our engineering team in this area. Merfyn Owen has just returned from the US again and the excitement among everyone involved is palpable. It’s clear to everyone that this is a very special project, a very exciting design and that so far a genesis conditions we’ve never had better for this boat type.